Fully immerse yourself in the Vits+Kicks experience with our bespoke mobile bar hire service. Our skilled team of professionals comes fully stocked and loaded with a selection of original Vits+Kicks alcohol and micronutrient enriched healthy cocktails ready to bring any occasion to life. 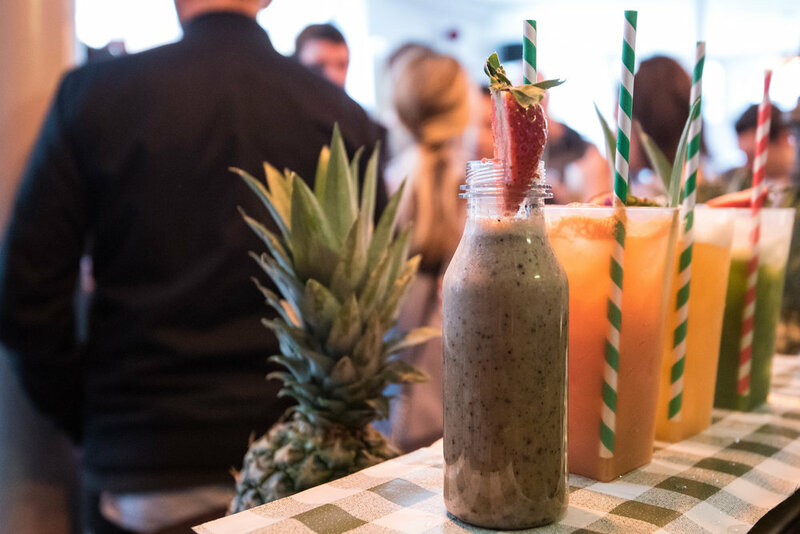 If you’re more about the ‘Vits’ and less about the ‘Kicks’ then satisfy your nutritional needs with our selection of healthy non-alcoholic juice and smoothie mocktail combinations. A thirst quenching gin & tonic, a welcoming glass of champagne or a selection of timeless classic cocktail favorites – you can compliment your Vits+Kicks healthy hedonistic concoctions with a traditional classic back bar offering tailored to each events specific taste’s. If you have a preferred choice of alcohol or a particular flavor combination in mind, please feel free to let us know and we will tailor our menu selection specifically to fuel you and your events healthy hedonistic needs. Learn how to mix the ‘mean’ with the ‘green’ Vits+Kicks style with our interactive cocktail making classes. - Be prepared to shake and get creative as you learn how to mix the two wonders together. Leave the car keys at home!